If you are looking for a project and you want to get started in Roarockit Skateboard Manufacturing, we offer you a training course! Participants will learn the process of building a skateboard and how to set up their own manufacturing courses, to become teachers themselves. 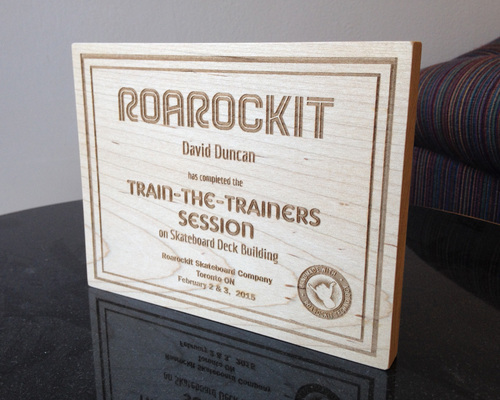 Each person will receive a Roarockit Training Booklet with a curriculum to inform and discuss course configuration, security, learning, administration and funding. Each will glue, press and finish his own Canadian maple skateboard. A certificate will be given to all those who will follow the 2 days of training. Sandpaper produces sawdust and wood particles, so we recommend wearing a mask during these steps. Allergies: Please notify if you suffer from allergies or other health concerns. Safety: When skateboarding is complete, Roarockit approves and advises wearing the helmet and other safety equipment at all times of use. Drive safely and according to your abilities. 2 times 6h session spread over 2 days to allow the drying of the glue. £290 per person from 1 to 5 participants. Add £45 each additional person (6 or more people). Introduction to skateboard construction using Thin Air Press technology. Discussion about skateboarding technology: traditional methods, subject in relation to wood, technique of gluing other brands, vacuum physics. Time management when running the program in class. Graphic design session: painting method and design criteria, skateboarding culture, graffiti, logo and intellectual property. Opening Thin Air Press, hand finishing boards. Practical session to give form; planing and sanding the skateboard boards. Finishing techniques using water-based paints. Final sanding and application of a base for painting. Session graphics: drawing and preparation of graphics for the application on skateboards. Expansion of the program: discussion to bring the program to another level, such as apprenticeship training, fundraising, or other opportunities for outreach social work. Please contact Brent at Roarockit UK to arrange a date for your training session and any additional information.